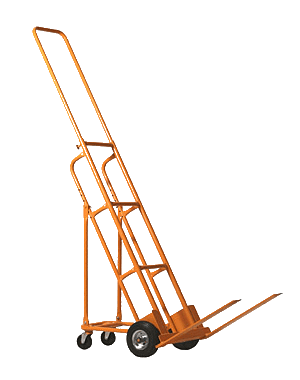 Ergo Wheeler Hand Truck | Drader Manufacturing Industries, Ltd.
Having the right tools at your fingertips is key for a safe work environment. For transporting those heavy loads, deliveries, and shipments, try our Ergo Wheeler. This wheeler has been ergonomically designed to improve Drader bread carrier and bakery basket handling. The user tilts the hand truck onto its back casters allowing the load to be easily pushed around a bakery or into a truck. The weight of the stack is on the casters, not the user, reducing worker injuries and physical strain. It provides superior control since both hands are free to navigate the stack. The user also benefits from increased visibility and fewer collisions.